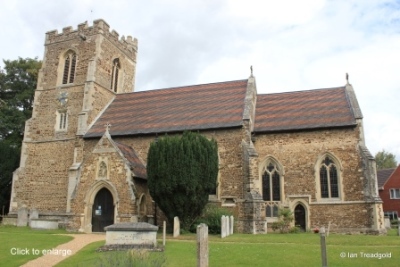 The church of All Saints, Clifton is situated to the north of the village on Church Street leading from Clifton to Stanford. On-street parking is not a problem in Church Street. The church consists of a chancel and nave with a north aisle and north chapel with a vestry to the north. 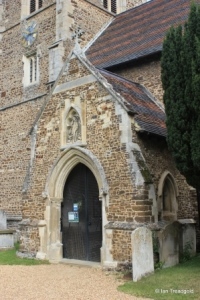 There is a west tower and south porch leading into the nave. 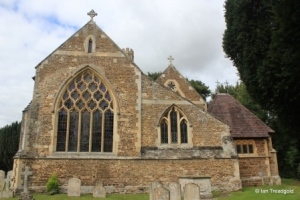 The chancel is around 21 feet long by 16 wide and the nave adds 39 feet by about 23 feet. The north aisle is of the same length as the nave and is 17 feet wide. The north chapel matches the length of the chancel and around 18 feet wide. The tower is 14 feet square and about 60 feet tall. 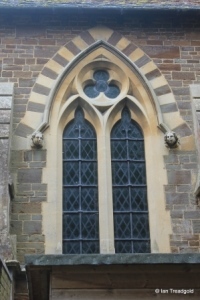 The south aisle has a single three-light window with trefoil heads under ogee heads and quatrefoil tracery under a two centred arch with carved corbels. 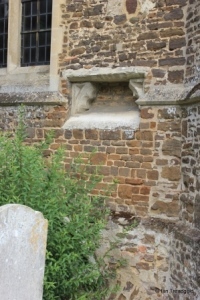 Below and to the east is a small blocked low window originally intended to light the south aisle altar. 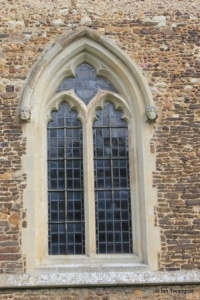 The south porch has singe light trefoiled windows to east and west. 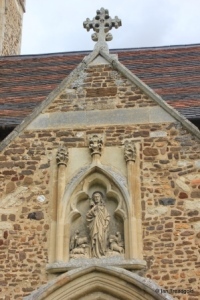 The doorway has a modern figure in a cinquefoiled niche with flanking pinnacles. 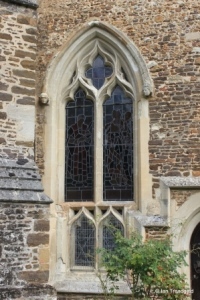 The remaining window in the south aisle is a two-light cinquefoiled window under a square head. The embattled west tower is in three stages. 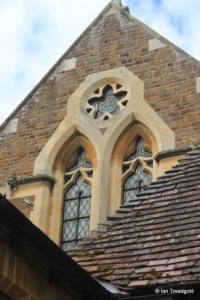 On the south side under the clock face is a two-light cinquefoiled window under a square head. 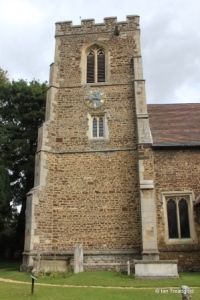 The belfry windows are of two-lights under four-centred arches. 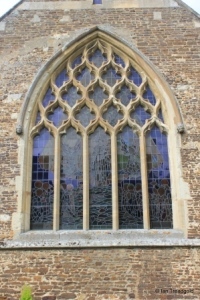 The west window has three uncusped lights under a four-centred arch. 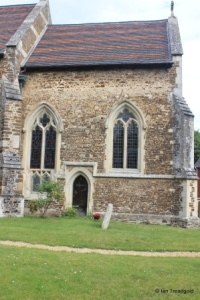 The stair turret in the north east corner is accessed from the outside. The north aisle is all modern and has a high west window of two trefoiled lights with a cinequefoil design above, all in a modern arch. 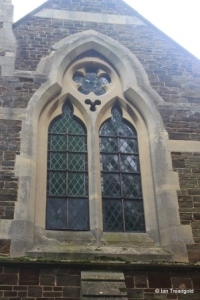 The north wall has three windows, the outer two are of three lights whilst the middle is of two. 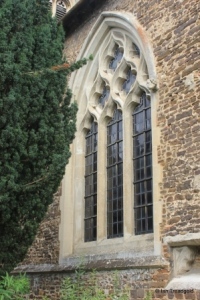 The east wall of the north aisle, above the north chapel has a modern two-light trefoiled window with cinquefoil design above. 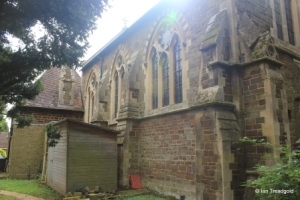 The north chapel has a sloping roof on a slightly different angle to that of the chancel and is much lower than the north aisle behind. 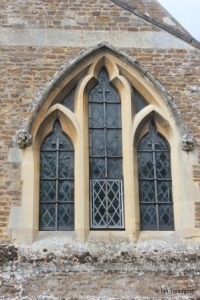 There is a single three-light trefoiled window, again in modern stone. 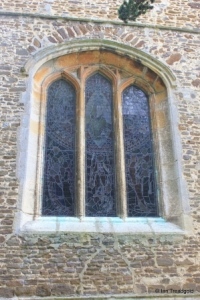 The east window is of five trefoiled lights under net tracery featuring an extensive quatrefoil design. The glass is modern. 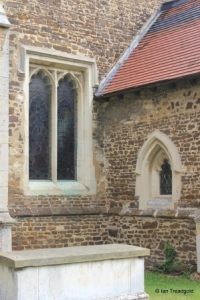 The south wall of the chancel has two two-light windows surrounding the priest's door. 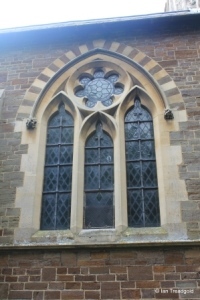 The eastern window is of cinquefoil design whilst the western is trefoiled. The western has a small two-light trefoiled window below. 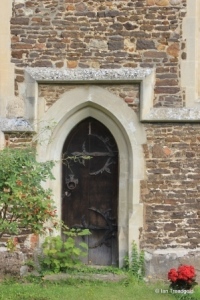 The door is in a plain pointed arch. Page last changed 02/09/2014. Reformatted 30/12/2015.